Grace your garden with ‘Seychelles’ and enjoy multiple harvests of uniform, stringless pods from this robust climber! 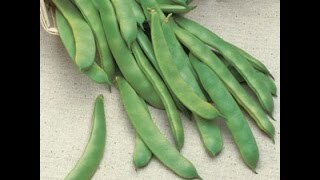 An All-America Selections Winner, ‘Seychelles’ produces bushels of beans on vigorous, dark-green vines. Ideal for canning and all your favorite recipes. Poles or trellis systems make for longer cropping periods, greater yields, and easier harvesting on these 7–9' plants. Bean, Pole, Seychelles is rated 3.6 out of 5 by 9. Rated 5 out of 5 by PaulTandberg from Good producer. 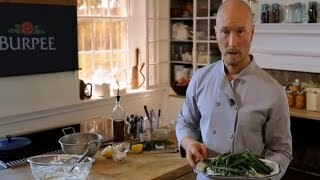 Healthy plants; tasty beans. I grew this last year and was very impressed. My "go to" pole bean through the years has been "Fortex" (Johnny's Seeds). Last season, Seychelles outperformed Fortex. It bore earlier, more prolifically, and produced deeper into the season than Fortex. It didn't stop producing. It was pumping out beans until a stiff frost took it down. The beans weren't as long as Fortex (few are) but they were plump, tasty and meaty. I will grow both Fortex and Seychelles again, but this year it will be two-thirds Seychelles and one-third Fortex. And if I could only grow one, it would be Seychelles. Rated 5 out of 5 by MiTim from Very happy! These beans produced heavily for us right up until the end if the season. Our family loved the flavor as well! Rated 4 out of 5 by Crabby Dollfin from Seychelles. Good Pole Bean I tried this bean this past year because we were looking for a stringless variety. We planted with Burpee's bean booster and grew on Burpee's Bean Pole. This bean grew well and had good flavor and size. We also grew the Blue Lake 47 bush bean next to it, but personally preferred this one and had better success with its yield. I'm ordering this bean again next year. Rated 5 out of 5 by PTND from A Winner! This bean delivered in spades for me this summer. It was about a week earlier than my other pole beans (Kentucky Blue and Fortex), and it is, as of this date, September 28th, still vigorous, healthy, and bearing heavily in my North Dakota garden. (my other varieties gave up the ghost weeks ago) There is a freeze coming tonight, so I will pick what I can.I will get a good-sized pail by the looks of it. I have never had disease free, vigorous pole beans bearing this late in the season before. We did have a dry July and August and there has not been much leaf disease on anything this year. It was a really good garden year. Rated 5 out of 5 by Akwiatkowski from Big producer of taste beans Great bean and will grow again. Plants are quick to grow and are now 7foot tall. Very high yield. Rated 1 out of 5 by JohnSr from Disappointing Flavor & Texture I was anticipating a fresh crisp bean but these beans had little to no flavor and the texture was disappointing for a fresh green bean. The beans germinated well and the beans looked good but I will not grow these again.